Two regional daily papers have been awarded £30m of government funding for a campaign which aims to boost businesses in the North East. Newcastle’s The Journal and Teesside’s Evening Gazette have been awarded the huge cashpot from the Regional Growth Fund to run a three-year programme of business support to help companies expand, called Let’s Grow. The scheme is set to create or safeguard thousands of jobs in the region and will focus primarily on small and medium sized firms, who will be able to apply for grants once it is launched in the New Year. Also awarded money from the Regional Growth Fund is the Wolverhampton-based Express and Star, which has been given £1.4m to help around 50 firms in the Midlands. 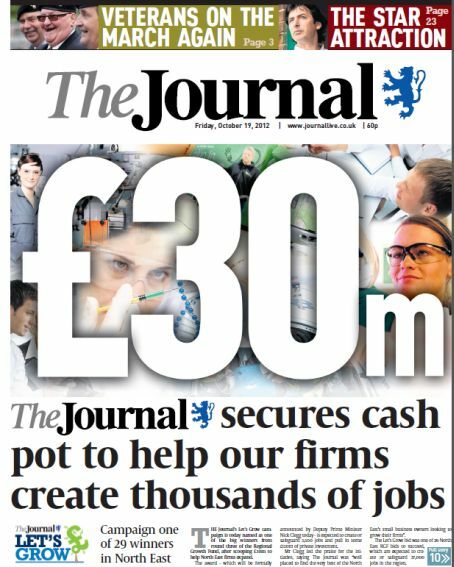 The Journal ran a similar campaign last year, which saw £3m secured from the same fund to give to 11 North East firms. Deputy Prime Minister Nick Clegg said: “I’m delighted that The Journal has been successful in securing investment from this £1bn round of the Regional Growth Fund. The two regional dailies have been joined in the campaign by accountancy firm UNW, the Business and Enterprise Group, Northumbria University and Teesside University. The funds will be awarded on a quarterly basis and bids will be subject to strict criteria and judged by an independent panel of senior business and civic leaders. The Express and Star’s Green Shoots Fund will run for 18 months from January, with four separate competitions for businesses to apply to. Editor Adrian Faber said: “We are aiming to help small and medium sized companies to get a financial boost along with advice and support to help create badly-needed jobs. The paper is working in partnership with the University of Wolverhampton, the Black Country Local Enterprise Partnership, the Black Country Chamber of Commerce and four local councils for its campaign. How is this going to be judged as a success or failure? And more importantly who or what is going to scrutinise it? I’m pretty sure the newspapers aren’t going to be too objective in their reporting. Trinity Mirror were at the forefront of the push to get rid of local authority ‘pravdas’ (even though they printed them), because of concerns over accountability. Surely this sets them up in exactly the same way – if it all goes t*ts-up, are the Journal and Gazette going to be covering that news in anything like an unbiased manner?